The wait is over! The bunker renovations have begun at Robert Black and we couldn't be happier! The bunker conditions have not been up to par over the past few years. We totally agree with you and understand how important the physical features on the course are to your overall golfing experience. Our main goal at Robert Black is to provide an enjoyable golf experience for everyone and we know this major project will dramatically improve the course and make golf at Black much better! Our agronomic team will be working extremely hard over the upcoming months. Bunker renovation is the most labor intensive project a superintendent faces. Unfortunately, it’s not simply dumping in new sand! The team is ready and excited for the challenge. As with most things in Chicago, weather conditions will determine how quickly the project will be completed. We will work as long as possible this fall and resume work in the spring. The goal is to have the project finished for guests to enjoy next season. In order to minimize play interruption, the team intends to be working on only one hole at a time. 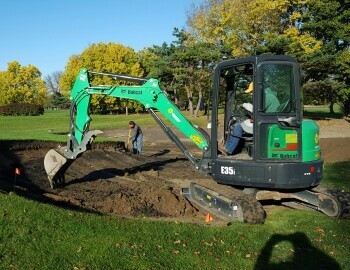 We appreciate you support, understanding and patience as we make significant improvements to the golf course and enhance your playing experience. Thanks and we look forward to seeing everyone out on the course soon!